Longitude 131° offers an exceptional Australian luxury outback experience for guests seeking an indulgent short break, the ultimate outback retreat or celebrating a special occasion in a unique and intimate environment. With just 16 private luxury tents, experience unprecedented personal attention and serenity. 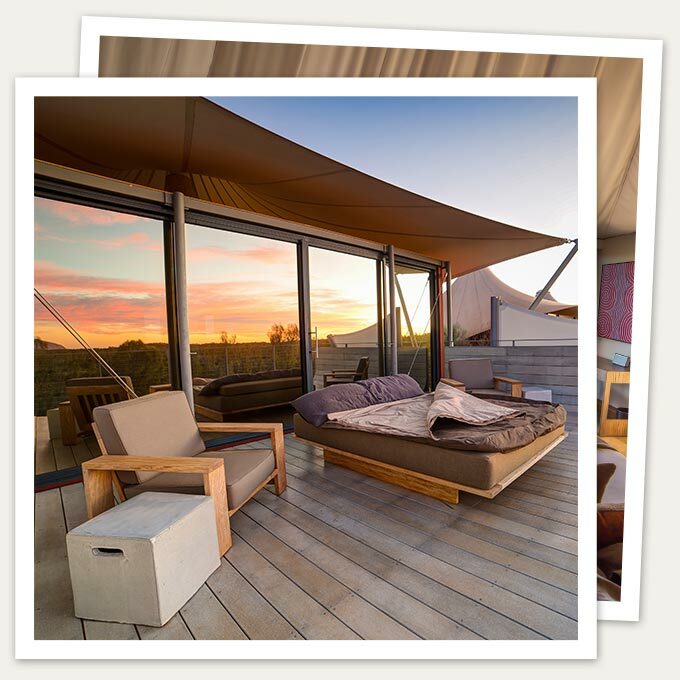 In the spirit of the original pioneers, guests stay in canopied pavilions that seem to float over the rust-red dunes. Luxuriously contemporised, today’s explorers are cosseted from the elements in surrounds that favour refined comfort over ostentation. Classic furnishings meld with aboriginal textures to evoke a sanctuary of earthy elegance. Each tent pays homage to an early Australian pioneer or explorer, with visual narratives adorning the walls central to the unique interior design. A private glass wall yields unparalleled views of the fabled outback icon, the flick of a bedside switch raises the blinds to reveal the spectacular moods of Uluru at sunrise. Air conditioning allows guests to remain cool in summer and warm in winter, whilst the spacious bathroom invites refreshment. A small desk equipped with iPad and MP3 input for entertainment complete the in-tent experience. Outdoors, the luxury continues...stylish new balconies feature modern day beds, armchairs and EcoSmart fireplaces, creating a contemporary outdoor living area while enhancing is unrivalled views of Uluru (Ayers Rock). Swags for the balcony are offered as part of a new evening service in which guests are served port, Cognac and other digestifs by firelight, along with a savoury treat prepared by the lodge chef. 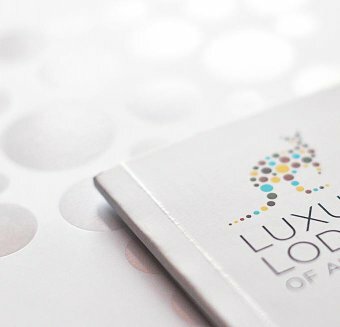 All inclusive rates: Included in the Longitude 131° experience is accommodation, all dining, open bar with premium wines and spirits, in-suite bar, signature experiences and return Ayers Rock Airport transfers. 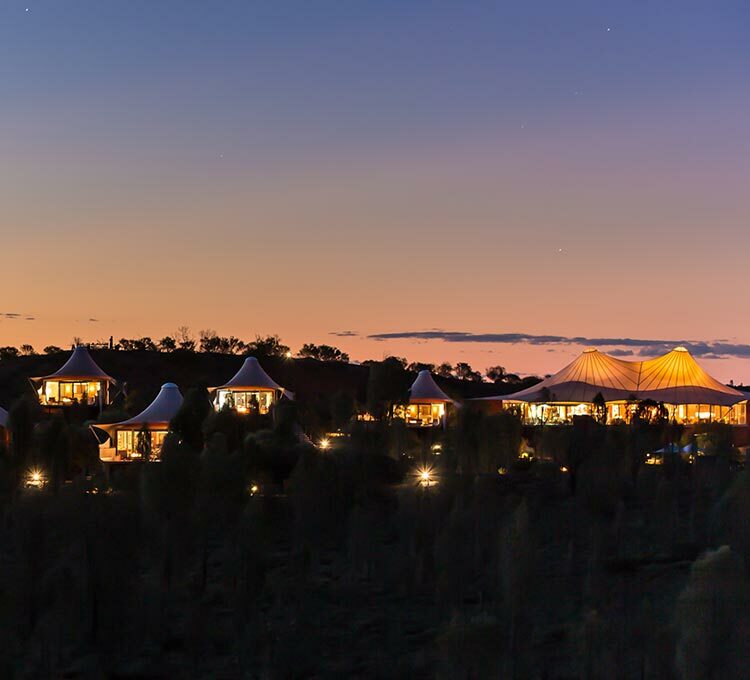 Longitude 131° is an eco-chic tented retreat, from where guests can explore ancient aboriginal landscapes and cultures by day, dine under a canopy of stars by night and be pampered in luxury accommodation and surroundings throughout. Stylish new balconies with modern day beds, armchairs and EcoSmart fireplaces, extend the luxury of Longitude 131° outdoors while providing guests with a new perspective on the surrounding desert landscape. Central to the new concept is a bespoke luxury swag for two, a modern reinvention of the traditional Australian bushman’s bedroll. 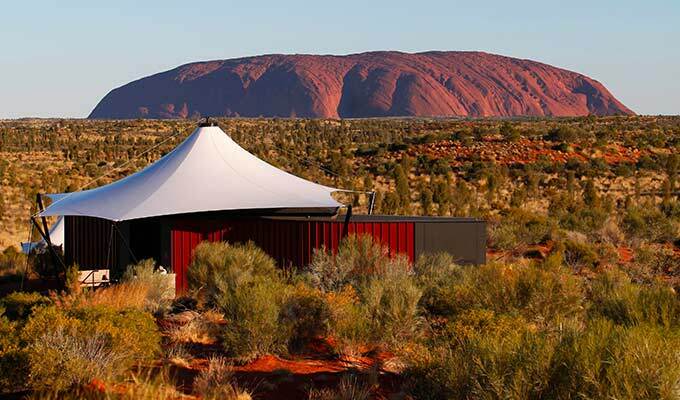 Unfurled at nightfall in front of the fireplace, it gives guests the option of sleeping beneath the southern stars.